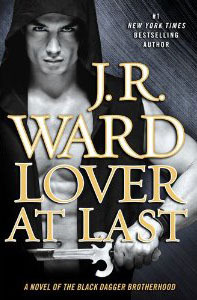 While at work today, I stopped by the “big box” bookstore to pick-up my reserved copy of J.R. Ward’s Lover at Last. I was so excited – no way was I going home without my copy of Blay and Qhuinn. I also picked up Jeaniene Frost’s new release, Twice Tempted. It took me a minute to find Twice Tempted (it wasn’t shelved with the new releases), but once I picked-up a copy, I headed to the front desk/ cashier stand (for lack of a better description). I figured t hat my reserved copy would be located behind the front counter. The woman working the front counter has waited on me before so we chatted, and I explained that when I was in the previous week, I had reserved a copy of Lover at Last (I explained that I knew it was released today, etc.). She checked behind the counter but was unable to locate my copy. She said that it could be located in Customer Service; maybe they hadn’t brought it to the front yet. She dialed the phone, but no one answered. She explained that they were very short-handed today. Given that, and the fact two other customers were now in line behind me, I told her not to worry, I saw a copy on the floor, I would go pick up one. Apparently she didn’t hear everything I said as she was concerned with trying to figure out where it would be located to assist me in finding it. I said again that it was no problem that I had located it, and I pointed to where Lover at Last was displayed. Jokingly, she asked me if I wanted a job. She commented that I certainly knew the store well; I would be a good bookseller. (Maybe when I retire??) I chuckled and headed off to get my book. When I returned with the copy, I got back in line (at the end of the line). The older couple in front of me motioned that I should go ahead of them, that I was there first. I asked if they were sure; they commented that they weren’t in any rush. The woman working the counter told them that they shouldn’t do that as I needed to stay longer so I could work. They needed my help in the store!! While I was very flattered, I left promptly after paying for both of my books. The offer was almost tempting – how nice would it be for a book lover to work in a bookstore?? Well, other than the fact all the money in my pay check would go back into the store! My only difficulty is now keeping myself from starting Lover at Last. Once I do, I won’t be able to put it down and nothing else will get done. So, today J.R. Ward posted a snippet from Blay and Qhuinn’s book on her Facebook page. I totally cannot wait for this book to be released! !